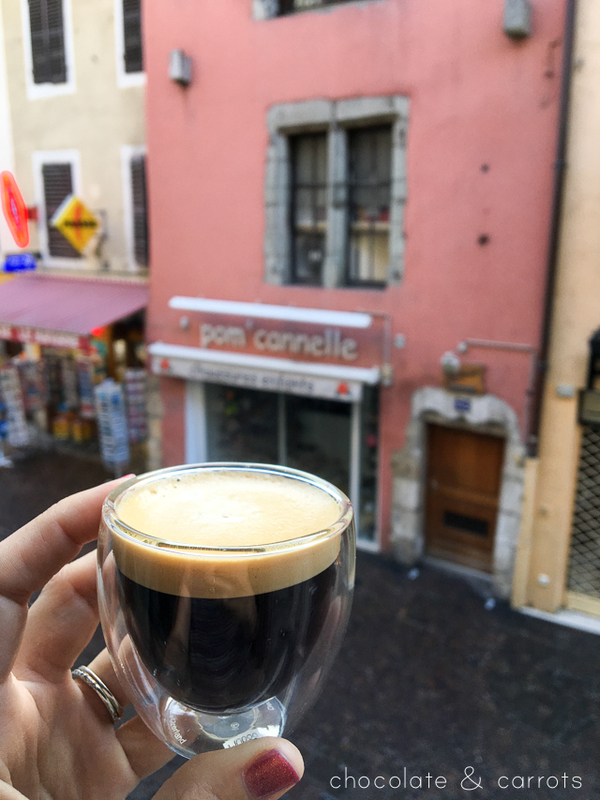 When people ask me my favorite place we visited during our trip to France, Annecy is the first that comes to mind and holds some of my fondest memories. The historic part of the city is just spectacular. The city is breathtaking. It’s walkable with safe streets and great food. It’s a pleasure to weave around in the streets and loose yourself in the beauty. 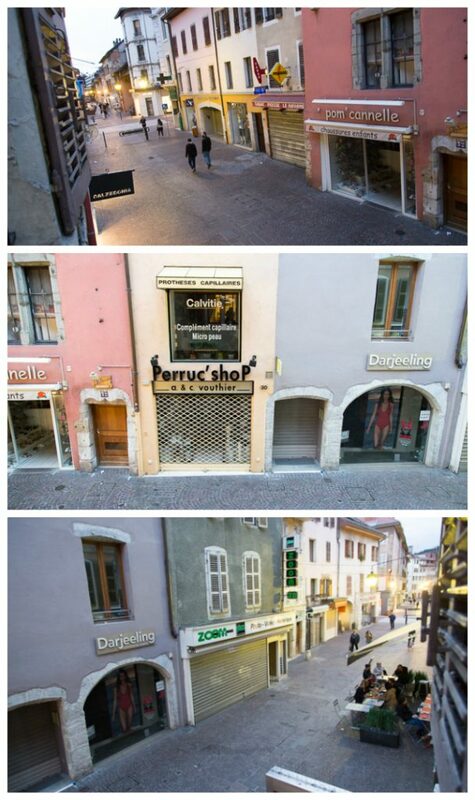 It’s known as the “Venice of the Alps” and it’s so true! 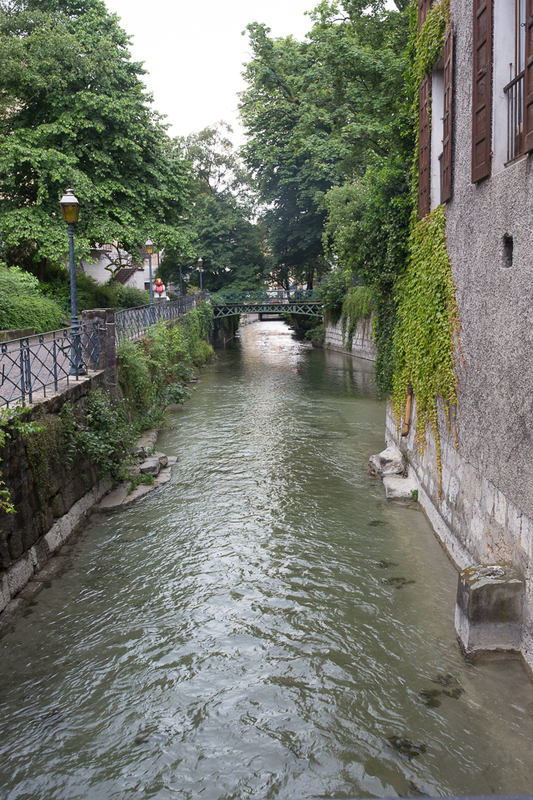 Every corner you turn, there’s another canal to walk along throughout the city. 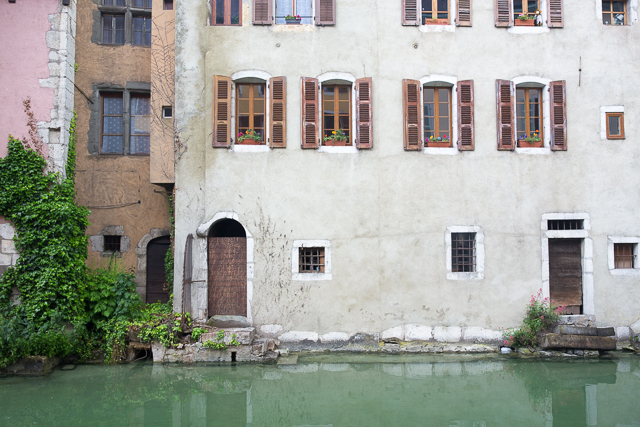 It’s magical with all of its colored houses, canals and bridges everywhere. You could walk all day and never cross the same path while exploring this lovely city. Everyone we encountered were extremely kind. There was hardly anyone there! 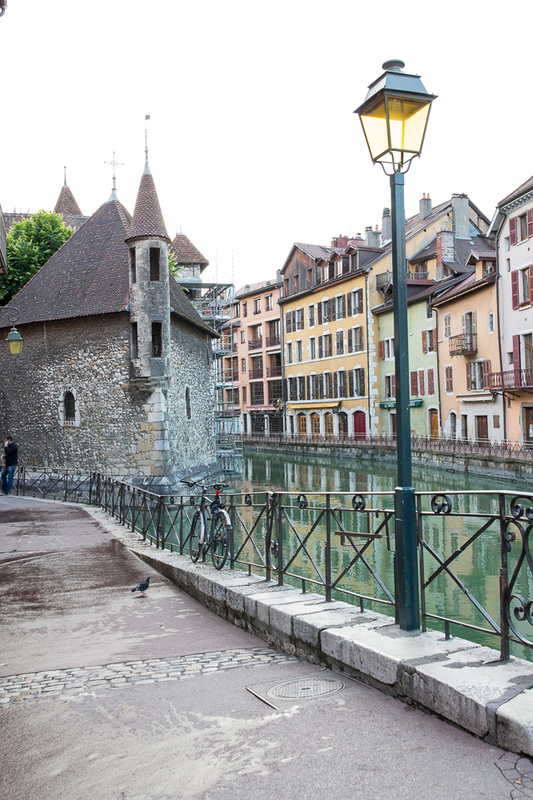 Having been to Nice and Aix-en-Provence the days before, Annecy was very sparsely populated. It was a nice change to feel like we had the whole city to ourselves! 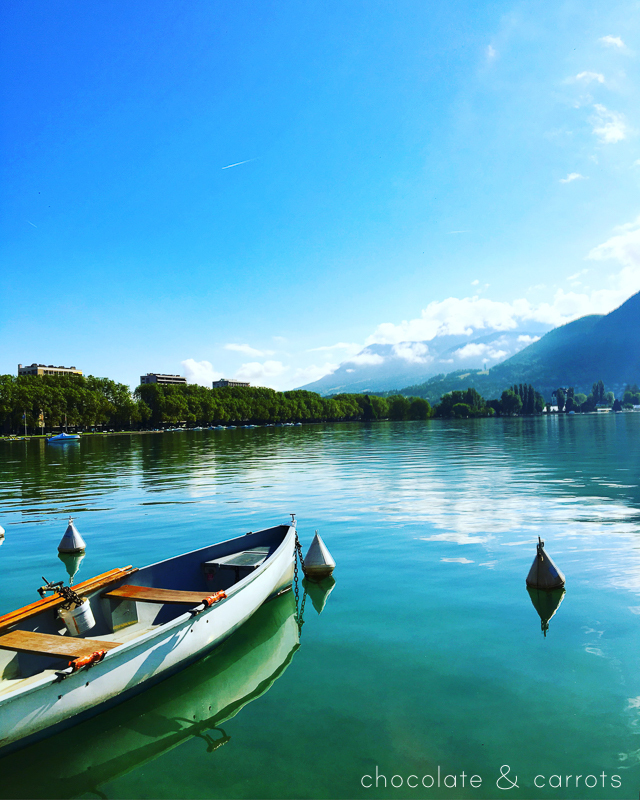 The weather was splendid being right on the base of the Alps on the Lac’de Annecy (the lake). 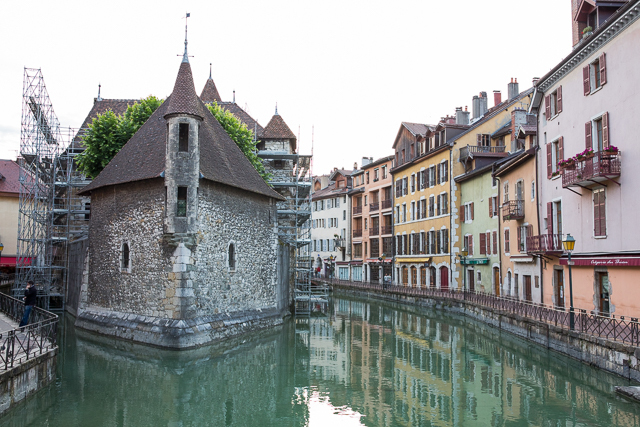 Since Annecy is right on the lake, you can take a stroll along it’s edge and enjoy the sites of the Alps up above. It’s truly a sight to behold. 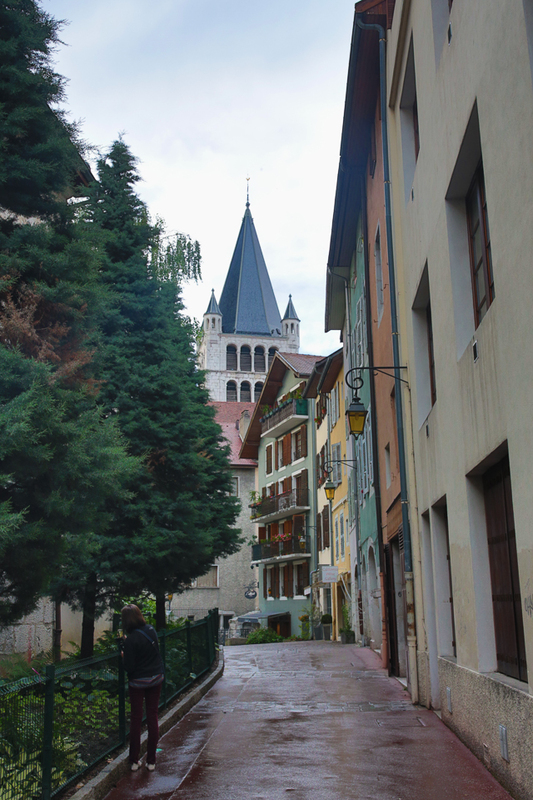 We stayed in Annecy for two nights, so it acted as a home base while we explored both Annecy and Chamonix (next post!). 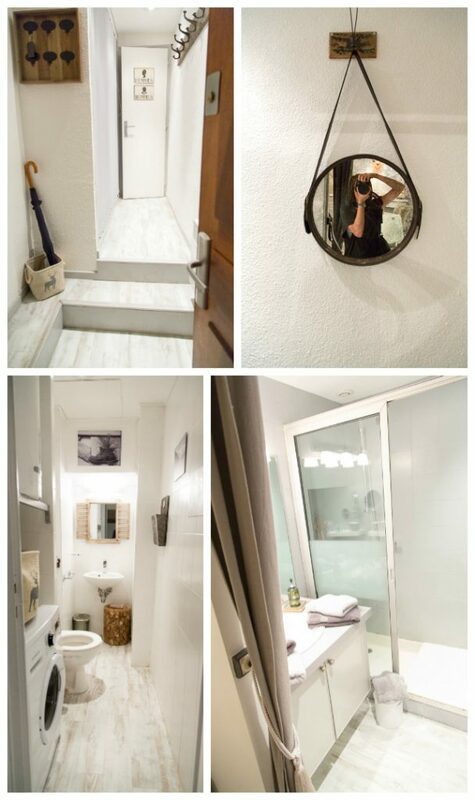 We LOVED our Airbnb apartment. It was on a pedestrian shopping street, decorated just our style and it even had a little bakery underneath! 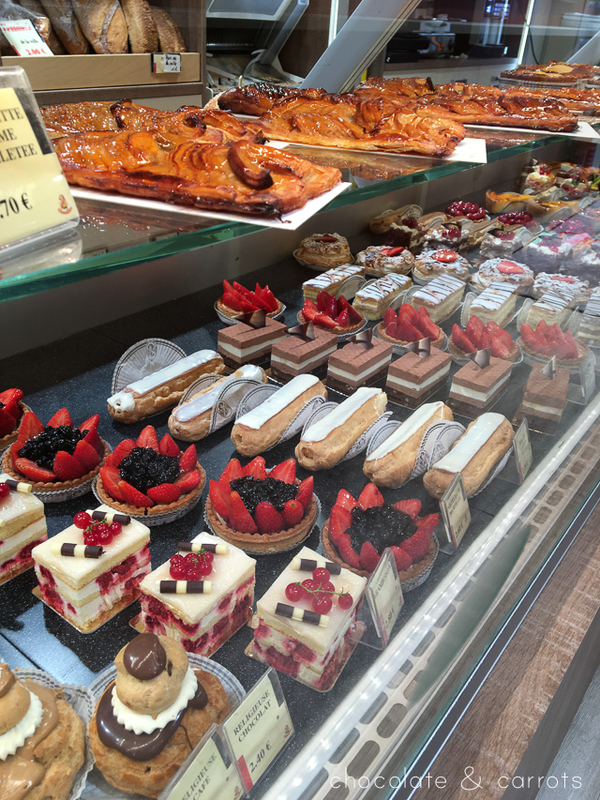 Below are two photos of the bakery under our Airbnb. 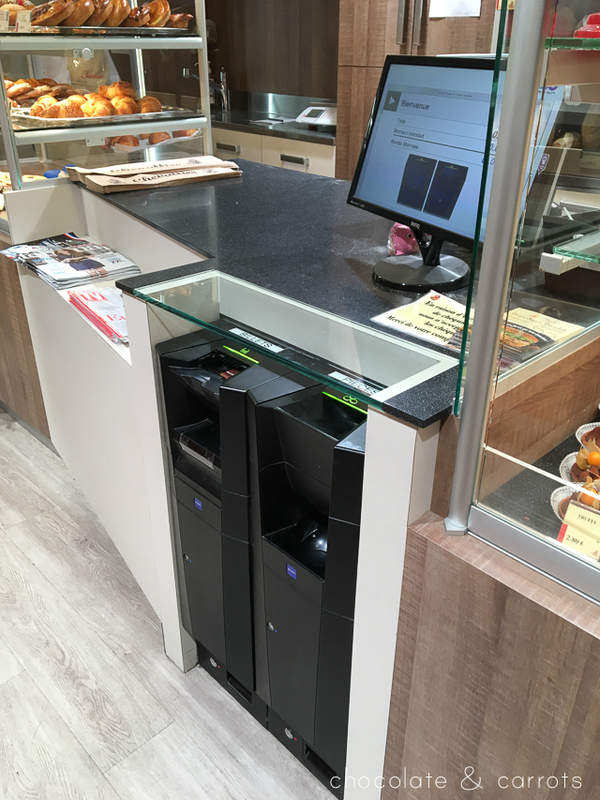 Self checkout stations were in almost all of the bakeries we went to. It was so nice! 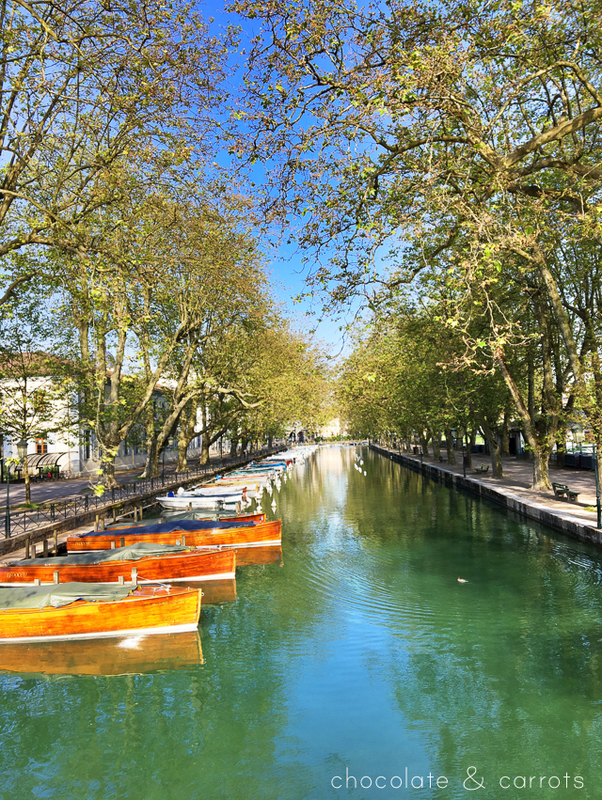 Walk around the Jardins of l’europe – gives you a vast look at the lake and beautiful surroundings. 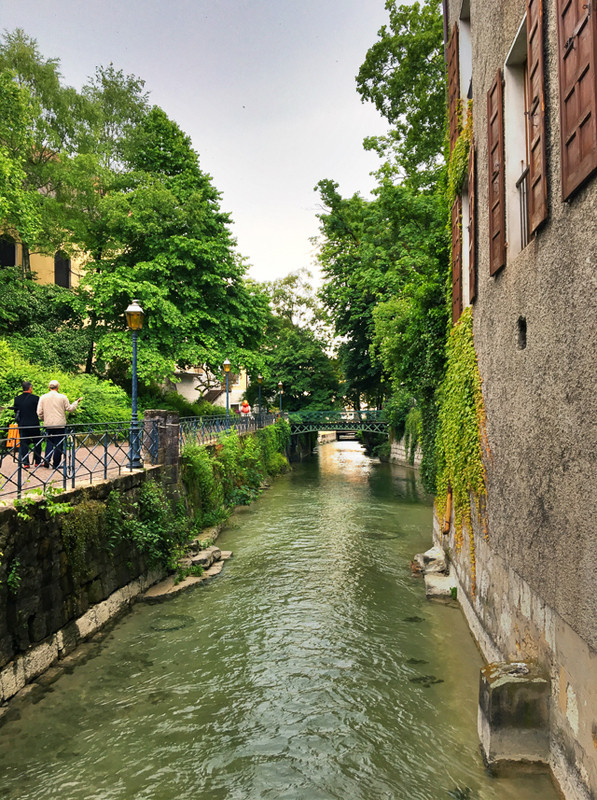 Stroll down the canal pedestrian streets – there are lots of them! Find a cafe to enjoy some food! 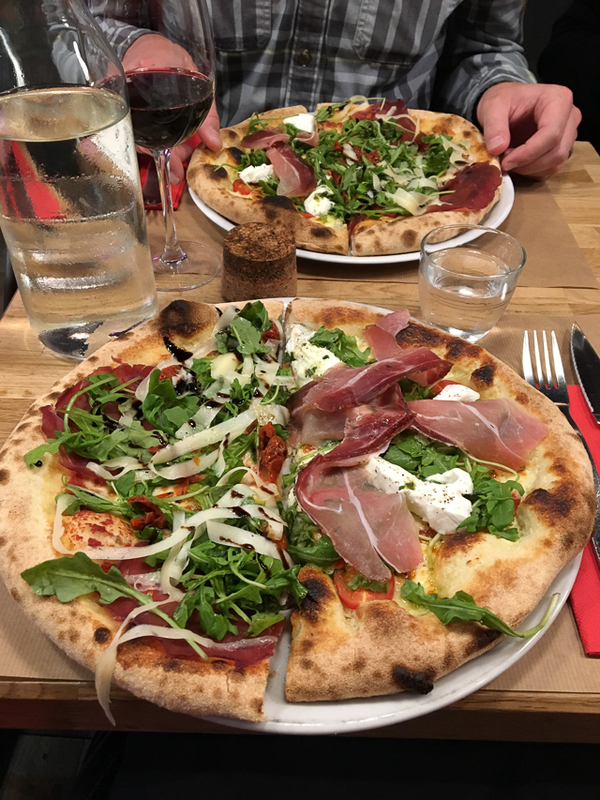 Little Italy Pizza – The best pizza we’ve ever had. 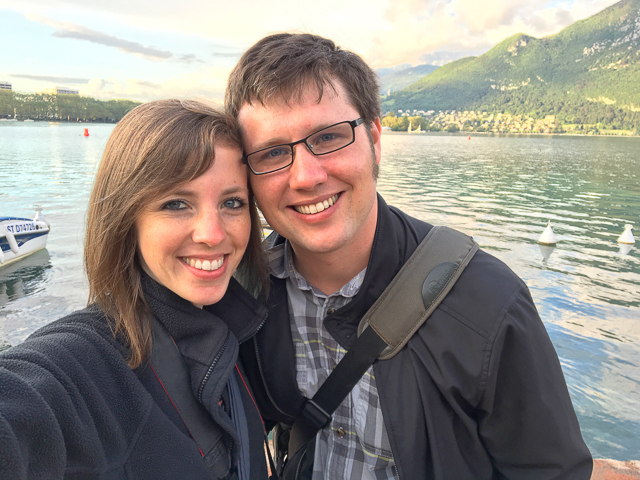 It was within close proximity to our Airbnb, right in the historic center of the city. But, be sure to get there early to get a seat or make sure to make a reservation. As soon as it opened they filled every seat! They also gave a complimentary shot of Limoncello. So nice! L’Etage – Good meal in the heart of the historic center. It’s good french food! 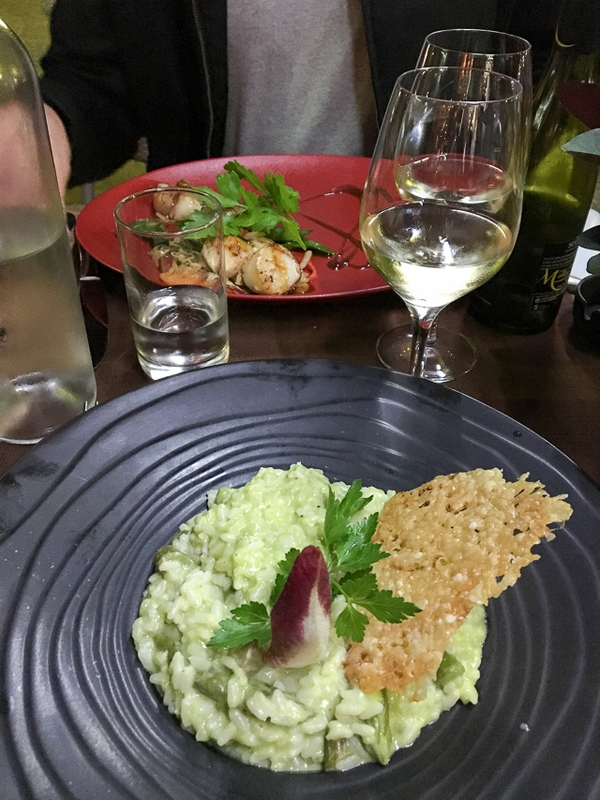 I had the asparagus risotto and Logan got scallops. 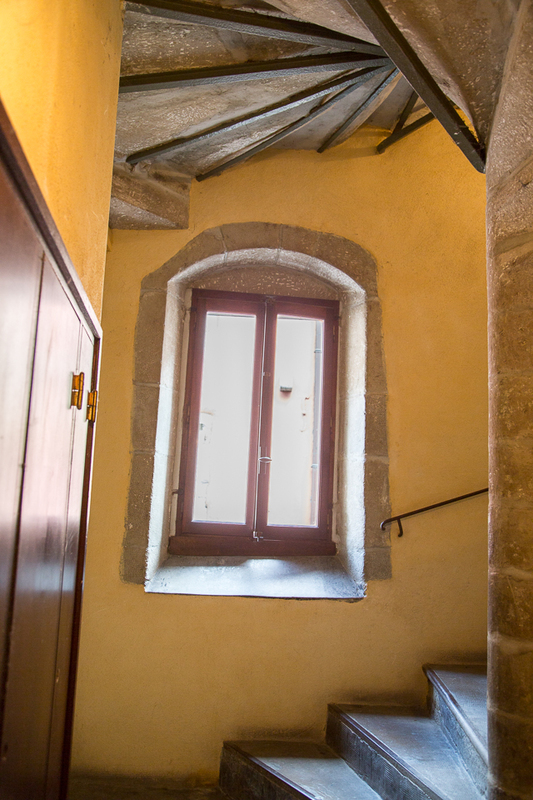 Le Bilboquet – Recommended by our Airbnb host. Nice French cuisine, but make reservations. L’Heure Bio – Recommended by our Airbnb host. Great outdoor seating, but make reservations. She said they have great salads. 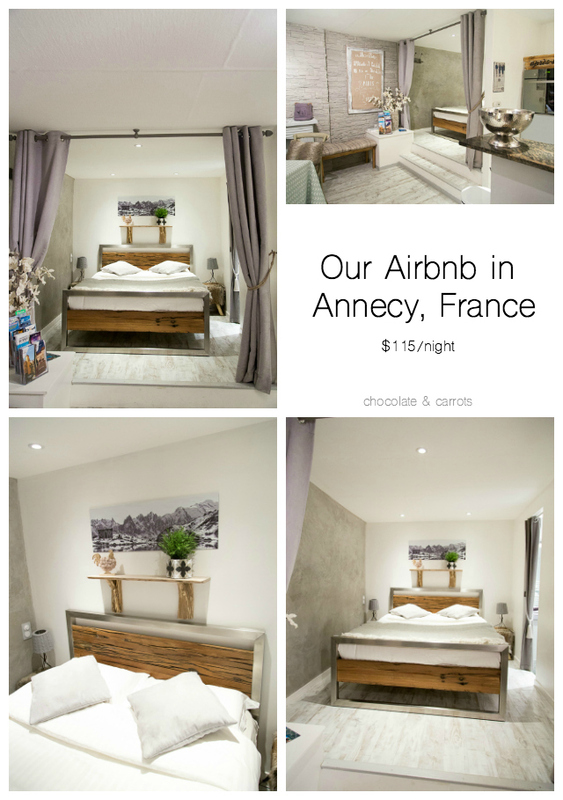 L’Encas bio – Recommended by our Airbnb host. Open for lunch only. Small but nice and colorful meals. 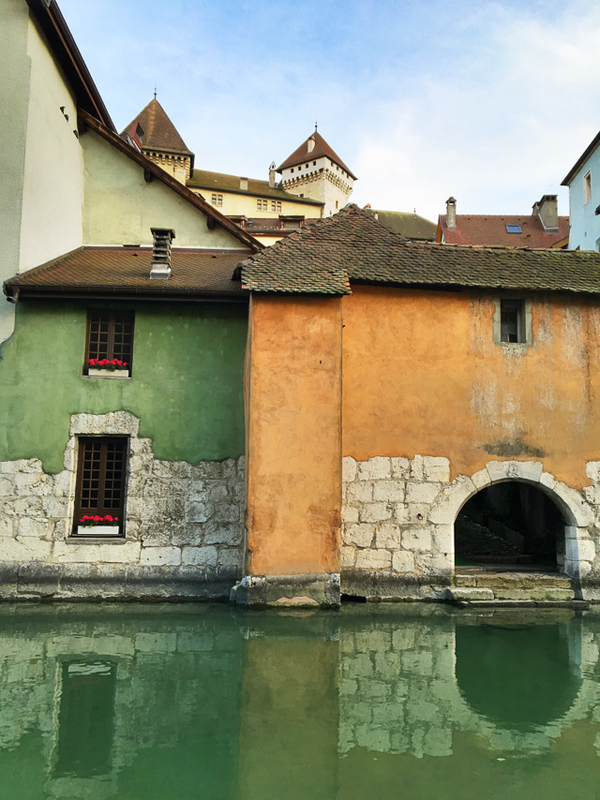 L’Auberge de Savoie – Recommended by our Airbnb host for great fish. L’Original – Recommended by our Airbnb host for Sunday brunch. 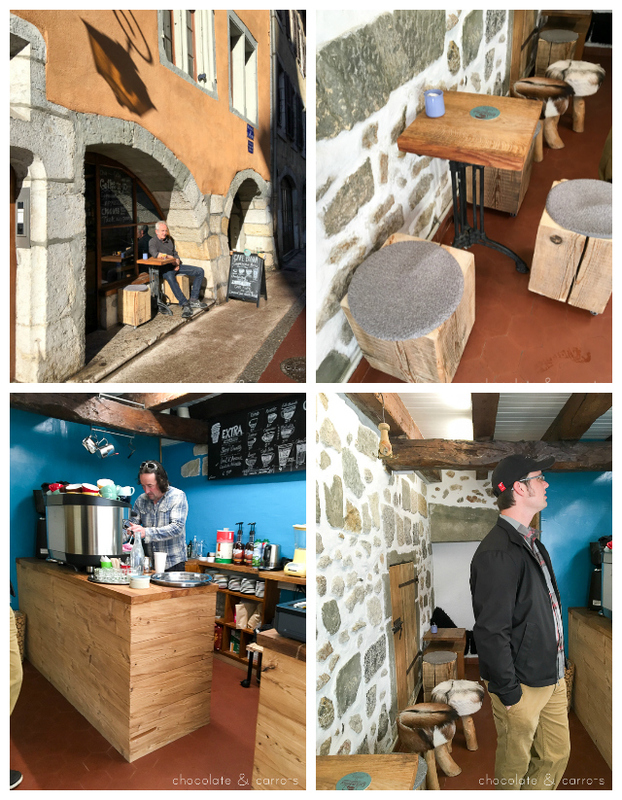 Stay tuned for the next post, all about our time in Chamonix…high up in the Alps! 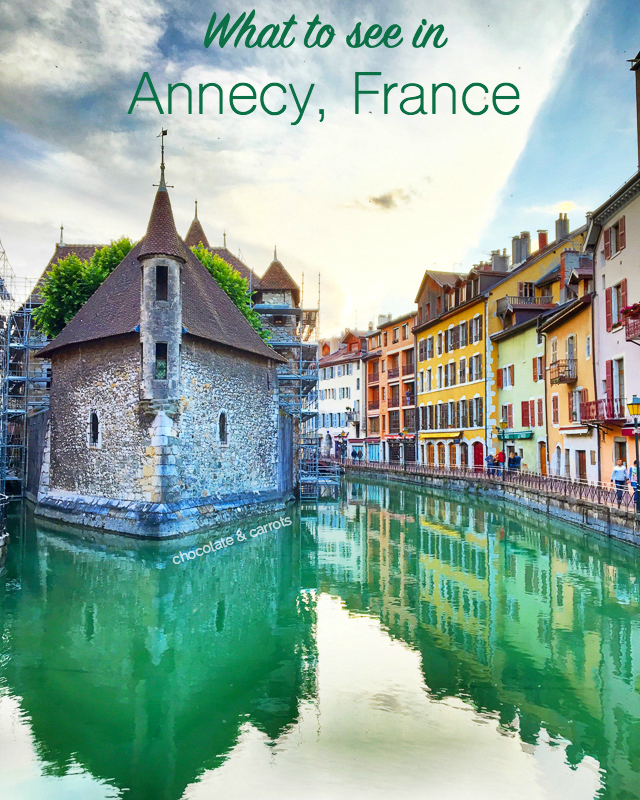 After reading your blog, I’m very interested in visiting Annecy! I was wondering if you could send me the link for the airbnb you stayed in? Would you recommend this trip for a family of 5, all adults? 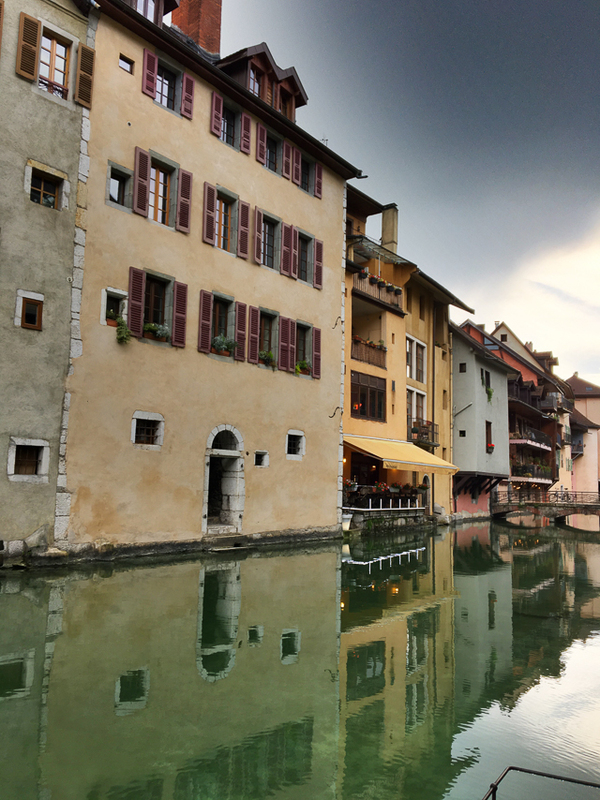 We were planning on staying 2 days in Annecy. Would you say spending 2 days there is too long? How much is there exactly to see? Hi Zahra! How wonderful! Happy to answer your questions! First off, here is a link to get $40 off your travel from airbnb (If you’ve never used it before…it’s a referral code where I get money towards my own next trip, hello more travel advice! Haha!). Here is the place we stayed in: https://www.airbnb.com/rooms/3301243 It’s only for two people, unfortunately. 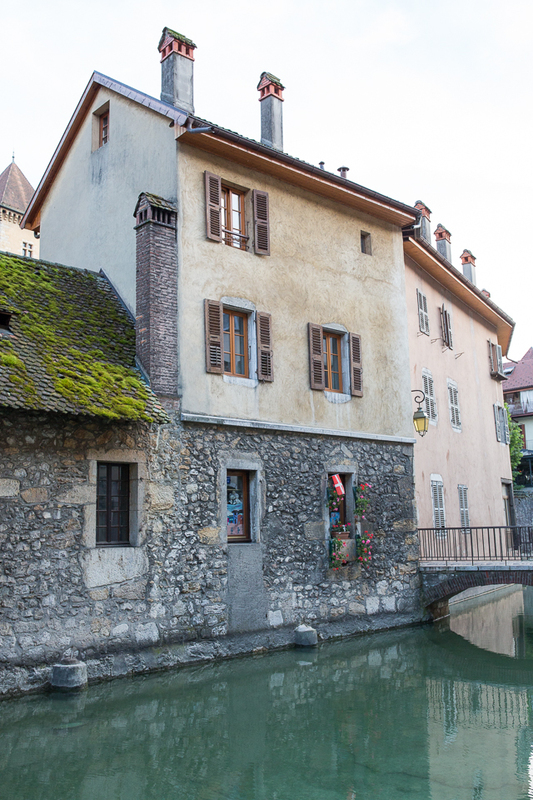 As for things to see in Annecy, I’d say it depends on what time of year you visit. We were there in the summer, so the weather was delightful (and quite chilly in Chamonix!). 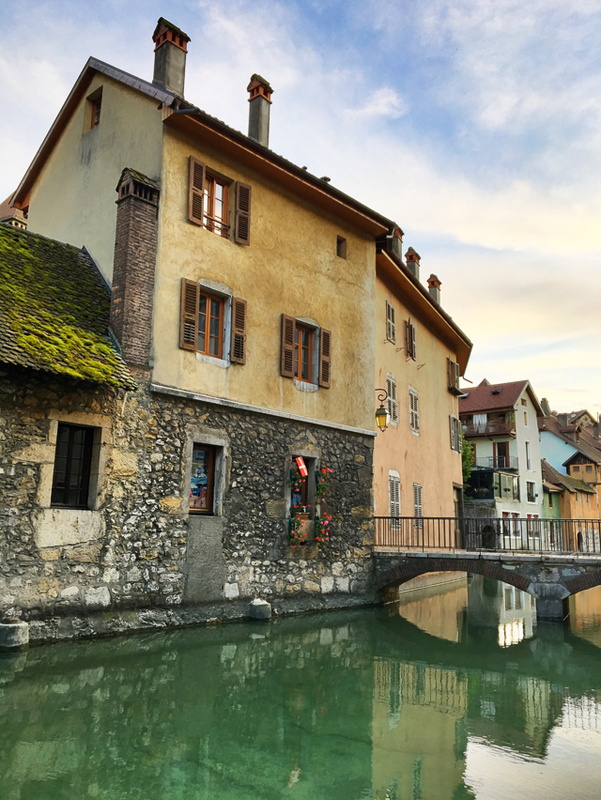 We loved roaming the old streets of historic Annecy, dining at cafes, walking alongside the lake. 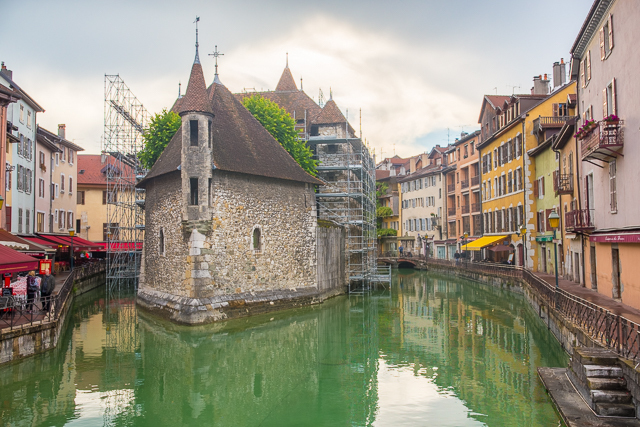 But, you could also take a tour of the Chateau de Annecy, visit the Palais de l’Ile, shopping, eating or take a boat ride around the lake. 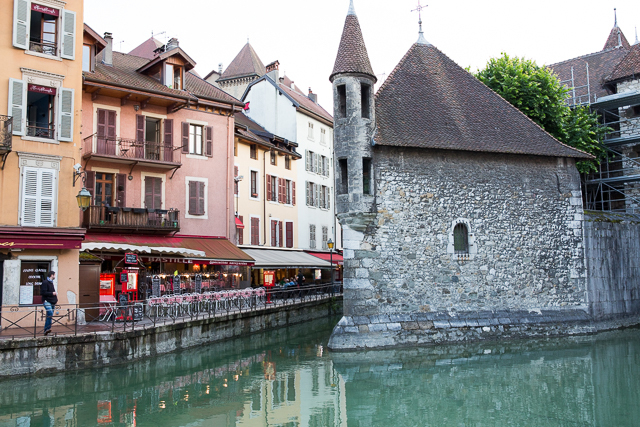 We just really loved the relaxed atmosphere of Annecy. It’s surrounded by beautiful nature and everyone seems to take it easy. It was definitely one the calmer places we visited in France, which we loved! We felt like locals there. If you have any other questions, let me know! Have a wonderful time planning and visiting! Great post. 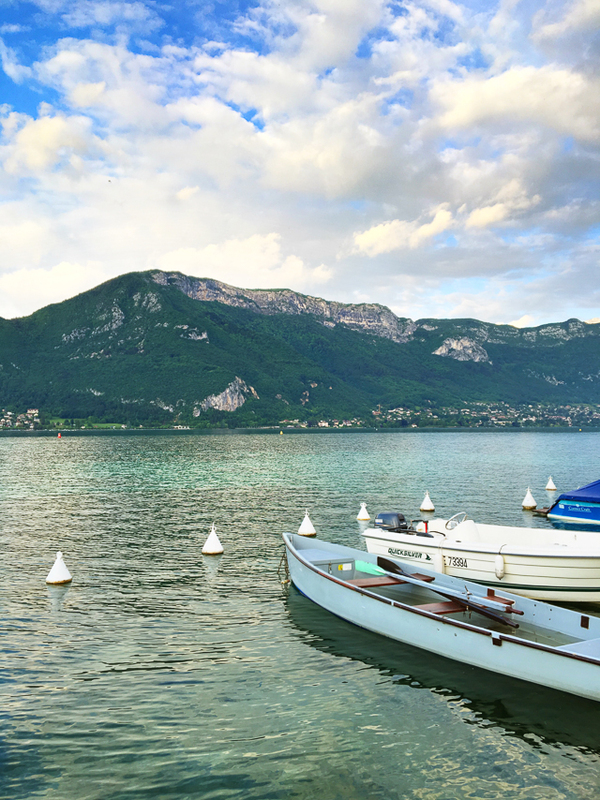 Hoping to go to Annecy next summer with my wife and baby daughter on a twin centre holiday along with Port de Pollenca. As an aside, we were in your home area of Charleston in the summer of 2014. What a beautiful place. Have been to many places in the States & I think Charleston blows all of them out of the water. That’s so wonderful to hear! 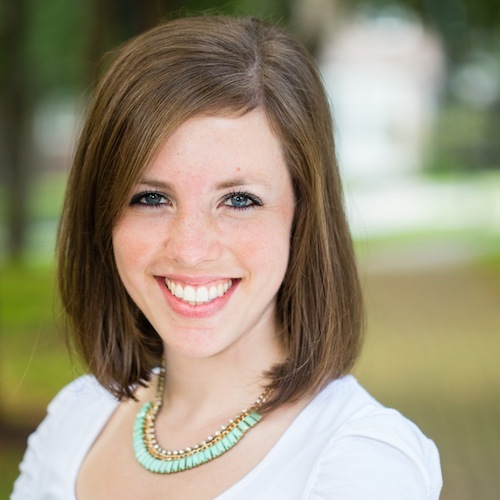 I’m so happy that you had a great trip to Charleston and I hope your trip to Annecy is a beautiful one!